Product code: ES7897 Categories: Art Deco, Art Deco Rings & Art Deco Engagement Rings. Here is such a unique and fancy Art Deco ruby and diamond ring from the 1920’s that makes such a statement on the finger and will no doubt continually be admired. Hand made in 18ct yellow gold and platinum, this fabulous ring is set with a border of thirty five rubies that not only highlights the diamonds in the centre, but accentuates the design. With a total weight of 0.28 carats, way the rubies flow along the edge with their vibrant red will always make this ring stand out day or night. And there is a cluster of nine European cut diamonds in the centre which add such an incredible amount of sparkle to this ring. These diamonds total 0.88 carats, and the top part of the ring measures 11.7mm across by 11.3mm and sits so well and flat on the finger. This is such a fabulous example of a genuine Art Deco ruby and diamond ring that is so exciting and beautiful to admire. 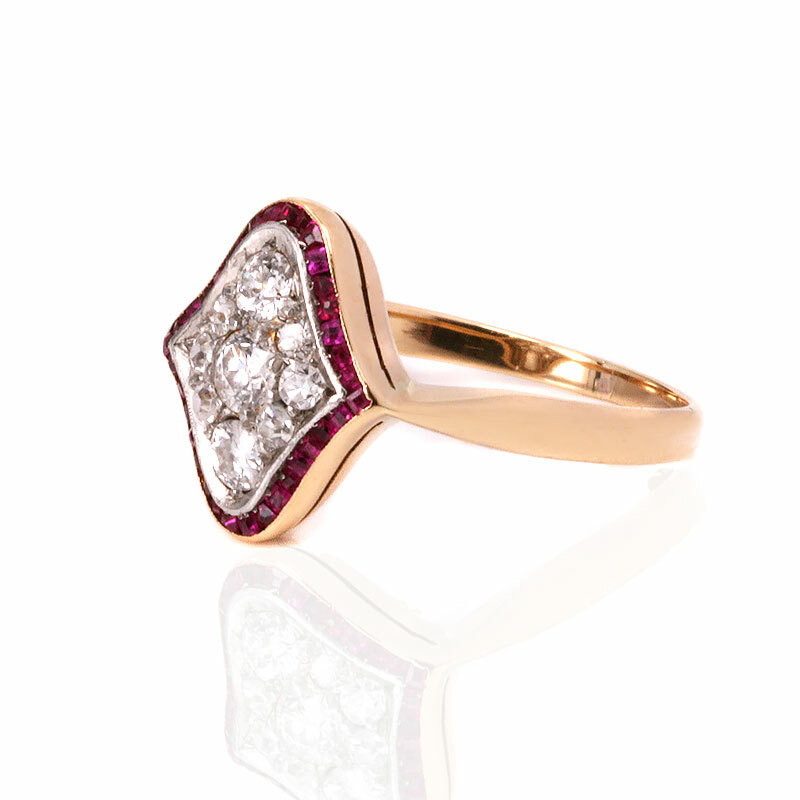 Tag: Art Deco ruby and diamond ring. The Art Deco era is without a doubt one of the more popular eras of history today. Limited to not only jewellery, but furniture, cars, clothing and architecture such as the Chrysler Building all conjure up romantic thoughts of an era gone past.